Home » Magnum Garage Storage System: New Components Available! 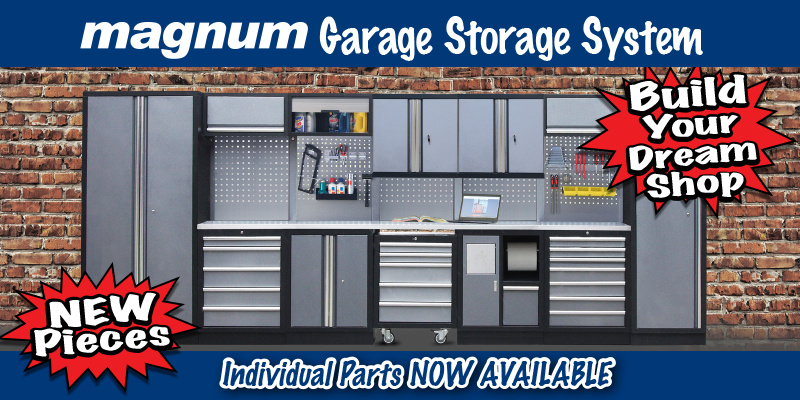 Magnum Garage Storage System: New Components Available! After the success of the original Magnum 20-Piece Garage Storage System, Magnum has expanded the system! There are now 26+ different pieces available, including new wood and stainless steel workbenches and a great selection of floor, rolling and wall-mounted cabinets. Now you can choose the components, configure them for your space and build the workshop of your dreams. 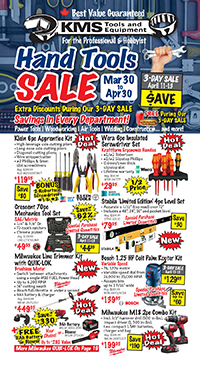 Check out your nearest KMS Tools location or flip through the KMS flyer to find the latest prices on the Magnum Garage Storage System, as well as amazing deals on a huge selection of tools and equipment for professional trades and serious DIYers. Like the original Garage Storage System, the new lineup is built with 18 gauge steel and a platinum hammertone finish. The drawers come standard with ball-bearing slides, soft liners and locks. The expanded Magnum Garage Storage System includes a corner storage cabinet, corner workbench, corner wall mount cabinet and corner pegboard panel. Now your workspace doesn’t have to end just because the wall does. The Magnum Garage Storage System, compatible with corners. The Garage Storage System also features your choice of either wood or stainless steel workbenches, available in three different lengths: 26″, 54″ and 80″. The table tops are 18″ deep and 1-1/2″ thick, a steady surface upon which you can put your tools to work—rebuilding carburetors, tinkering with lawn mowers, repairing computers or modding drones. 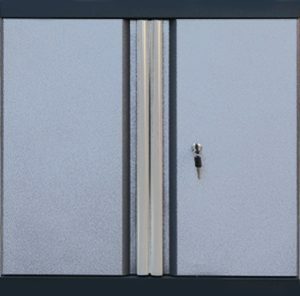 The original Magnum Garage Storage System features a 79″ tall locker-style cabinet with a single door. The expanded lineup introduces a new double-door tall cabinet that’s 79″ tall and 36″ wide. That’s 12″ wider than the single-door tall cabinet. Both tall cabinets provide an excellent storage solution for work wear, safety equipment or long-handled tools. 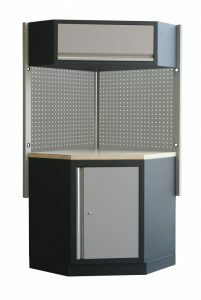 They also make ideal endcaps for a range of garage cabinet configurations. Regardless of whichever cabinets and drawers you choose, Magnum’s pegboard panels offer additional storage space and a great way to bring the entire system together. Rugged, functional and fully customizable, the Magnum Garage Storage System could be the cornerstone of your dream workshop, providing storage space, a durable workbench and easy access to all your tools. Stop by your local KMS Tools store of visit kmstools.com and turn your dream shop into a reality. This entry was posted in Archives, Shop Equipment and tagged magnum tools, main_page, shop equipment, tool boxes by Your Friends in the Tool Business. Bookmark the permalink.